In September 1939, with the Second World War just begun, many across the globe began to suffer and face economic uncertainty. This resulted in a forced redefinition of priorities, as resources became scarce and as the demands on these resources increased. Even Dumbarton Oaks founder Robert Woods Bliss was not immune to such wartime financial challenges, and his ability to acquire artworks for the Dumbarton Oaks Collection was temporarily reduced. However, the troubled times of the war years and the resulting financial precariousness also brought about price reductions and afforded bargaining opportunities that previously had not existed. Bliss would take advantage of this in his negotiations with art dealers. In a series of letters to the dealer Dikran Kelekian dated between September 26 and December 18, 1939, Bliss outlined the status quo as he saw it. He lamented that the war would “cause sorrow, suffering, and misery to a vast number of people,” including Kelekian, who had had to leave France for Lausanne, Switzerland, and, later, New York City. Bliss explained that he had “many calls now for assistance to war relief in various parts of Europe to which one cannot turn a deaf ear, any more than one can to the deserving appeals to help one’s own countrymen.” He concluded: “You must understand that we are not now in a position to act as we did before,” underscoring the economic tumult and travail which would characterize the next few years. Egypto-Roman faience vase with a Dionysiac procession, first century BCE, BZ.1939.31, Byzantine Collection, Dumbarton Oaks Museum. I received this morning your very kind letter of September 26th, addressed to me from California to Lausanne. I wish to thank you sincerely for your sympathy and to assure you once again of my devotion to you and of my earnest desire to be of service to you. The change of circumstances which you explain, I quite understand. In view of the situation I expect to make great sacrifices to be able to do business. With regard to the Egyptian pottery vase which you mention, I need not point out that it is a unique piece and a most important document in the history of ceramic art. It is the link that connects the two great arts of Egypt and Persia. I purchased it over thirty years ago and was so very fond of it that until the time I showed it to you about two years ago, I had kept it in the bank and had not even shown it to my son. Every book on potteries hereafter will have to mention it. It is perhaps my extreme love for this piece that made me ask a price which you considered prohibitive, although for an outstanding, unique piece I believe there is no price. I asked $25,000.— and you thought $10,000 would be a fair price to which I did not agree. In view of the present circumstances I am now willing to accept $10,000.— for this piece. I trust these drastic reductions will be satisfactory to you. I want very much to see these two unusual pieces added to the Dumbarton Oaks Collection. 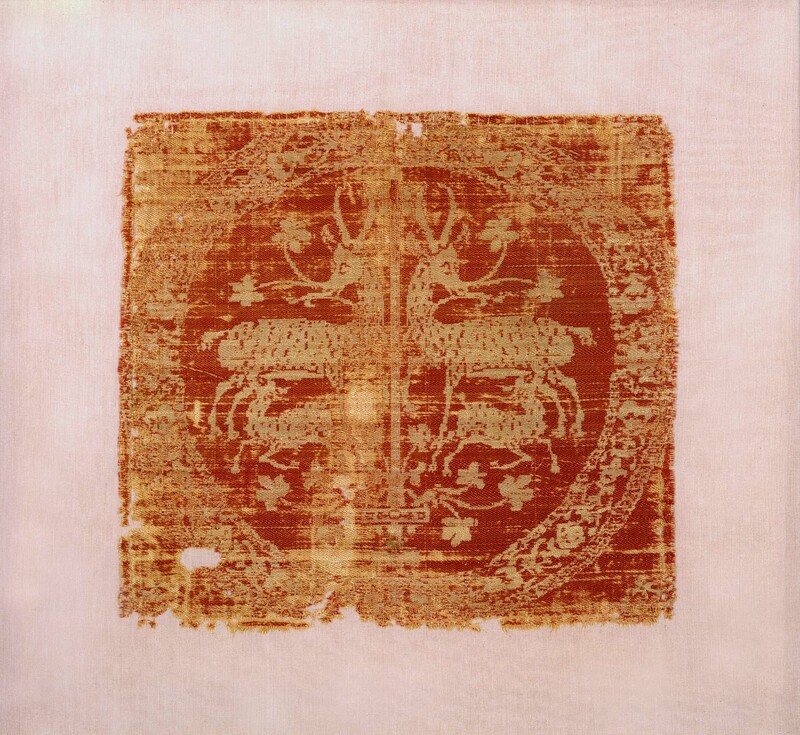 Textile with antelope in a roundel, late seventh to first half of eighth century, BZ.1939.32, Byzantine Collection, Dumbarton Oaks Museum. Two textile fragments with ibexes in roundels, fifth to early sixth century, BZ.1939.33.1–2, Byzantine Collection, Dumbarton Oaks Museum. Bliss acquired these two pieces in December, along with two early Byzantine textile fragments with ibexes. The purchase price, however, involved a further reduction: Bliss paid $7,750 for the lot, having told Kelekian that he was no longer in a position to pay even $10,000 for the vase. Although greatly disappointed in the offer, Kelekian agreed. As for other pieces offered by Kelekian, Bliss had to dismiss them as having “no appeal to or place in the Dumbarton Oaks Collection,” a statement perhaps motivated as much by limited financial resources as by personal taste. [Kelekian] has a holy wonder of an Egypt-Byz. pottery vase (a big jug, really), with bonshommes and vines in relief, with a buff-creamy glaze with touches of green (for the leaves) and dark sang-de-boeuf or aubergine (for the grapes). Not quite intact—lip damaged and handle gone, but body perfectly preserved, and, I regret to say, a wonder of wonders. The old rascal asks $25,000 for it. Something has got to be done be­cause I have a feeling that the pottery will have to come to Dumbarton Oaks and certainly nothing approaching the price he mentioned to you can be paid. Do think about this and have some inspiration as to the sort of technique we might use. The “technique” presented itself the following year with the outbreak of war and the economic constraints that ensued. Bargaining in those troubled times resulted in a seventy-five percent reduction in the purchase price.